The Euro closed with modest losses yesterday after ECB Governing Council member Ewald Nowotny said that Italy’s debt was a threat to the EU. Additionally, Deutsche Bundesbank President Jens Weidmann argued that there is no need for the ECB to raise rates, which dented the market sentiment even more. In economic news, Consumer Confidence Index improved to -7.4 in February from -7.9 in January. The Services Sentiment Index and the Business Climate Index also rose in the same period while the Industrial Confidence Index fell to -0.4 from 0.6 in January. Today, the EU will release the German, French, Italian, and Spanish CPI numbers which could impact the Euro. But short-term traders will mainly focus on the US GDP data. The Euro was unable to close above 1.14 (R1) yesterday once again. 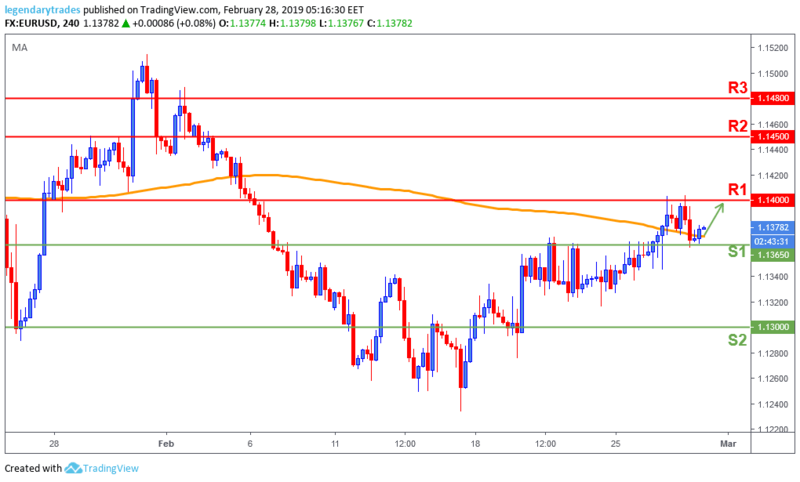 Price pulled back and found support at 1.1365 (S1), and now looking to retest 1.14 (R1) for the third time in a row. A successful break above 1.14 (R1) will open the doors for a possible 1.1450 (R2) retest. Alternatively, if 1.1365 (S1) is lost, then the bulls will lose control and price will tumble back towards 1.13 (S2).